Multiple myeloma (MM) is a monoclonal gammopathy, also known as the malignant proliferation of plasma cells, presenting with typical complications such as hypercalcemia, osteolytic bone lesions, anemia, renal insufficiency, and frequent infections. Central nervous system (CNS) involvement in MM in the form of parenchymal involvement is very uncommon and has been reported only in 1% of patients. CNS involvement as an initial presentation is very rare and has poor prognosis. Also specific treatment guidelines do not exist for the treatment of such patients. 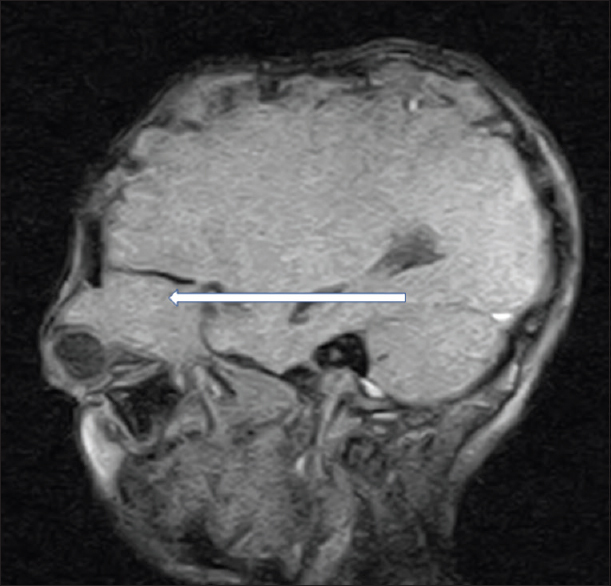 We present here a case of a 40-year-old female patient, with complaints of headache and left eye proptosis followed by left-sided hemiparesis, who after complete workup was diagnosed as a de novo case of stage III extramedullary MM with CNS involvement. Patient was treated with whole brain radiation followed by BCD regimen (injection of bortezomib, injection of cyclophosphamide, and tablet dexamethasone). After three cycles of chemotherapy, patient succumbed in view of consolidation and renal failure. Multiple myeloma (MM) is a monoclonal gammopathy, also known as the malignant proliferation of plasma cells, presenting with typical complications such as hypercalcemia, osteolytic bone lesions, anemia, renal insufficiency, and frequent infections. Central nervous system (CNS) involvement in MM is very uncommon and has been reported only in 1% of patients. Cerebrospinal fluid (CSF) cytology and brain magnetic resonance imaging (MRI) in addition to routine myeloma workup is essential for diagnosis. Different modalities of treatment, including intrathecal chemotherapy, cranial irradiation, and systemic chemotherapy, are used. We present a case of a 40-year-old female patient, with complaints of headache and left eye proptosis, and after complete workup was diagnosed as a de novo case of stage III MM with CNS involvement. A 40-year-old female patient presented to ophthalmologist with complaints of headache and left eye proptosis of 3 months duration. Proptosis was gradually increasing, painless in nature, and associated with decreased vision, excessive lacrimation, and redness involving the left eye. On ophthalmic examination, left supra and periorbital swelling was appreciable with left eyeball being pushed downwards and inwards with axial proptosis [Figure 1] and restriction of eye movements in all directions. There was increased retrobulbar resistance in left eye. Rest general examination was within normal limit. As patient was being investigated for proptosis by the ophthalmologist, the patient developed left-sided weakness for which consultation was done with neurologist. On neurological examination, left-side power was grade 4/5 in both upper and lower limbs with exaggerated left deep tendon reflexes. Rest cranial nerve examination was within normal limits. Laboratory studies showed following abnormalities: Hemoglobin (6.2 g/dl), serum creatinine (3.5 mg/dl), serum uric acid (8.4 mg/dl), and serum albumin (2.19 g/l). MRI of brain and orbits was done, which showed a 5.2 × 2.9 × 5.6 cm intraaxial mass lesion in right temporo-parieto-occipital region with similar lesion in extraconal compartment of left orbit causing proptosis of left eyeball [Figure 2] and [Figure 3]. Along with these findings an unusual finding of multiple varying sized lytic lesions was appreciable involving skull vault, base, and multiple cervical vertebrae. In view of these findings, patient was referred to the oncology department for further workup. As MRI showed presence of multiple lytic areas, skeletal survey was done which confirmed lytic lesion in the MRI mentioned areas, and in addition, few lytic lesions were appreciable within the ribs and pelvic bones. The differential diagnosis of secondaries from an unknown primary, blood cell-related tumor including lymphoma or plasma cell dyscrasias was done. Serum parathyroid and thyroid levels were within normal limits. To look for an unknown primary from the lung, gastrointestinal tract, and breast, endoscopy, colonoscopy, stool examination, and breast examination were done. Computed tomography (CT) (abdomen with pelvis and thorax) did not point to any primary lesion. As a part of the workup for hematological disorder, bone marrow examination was done, which showed presence of 70% plasma cells [Figure 4]. CSF cytology did not show any malignant cells. Serum protein electrophoresis showed presence of monoclonal peak in gamma region. Serum immunofixation study showed the presence of elevated immunoglobulin G [6892 mg/dl (700–1600 mg/dl)] kappa levels. As the patient was not willing for the biopsy from intracranial space occupying lesion, tentative diagnosis of stage III MM with extramedullary involvement (orbital and brain metastasis) was done. As part of the workup, beta-2 microglobulin was done, which was elevated, i.e., 78 ug/ml. Patient received whole brain radiation therapy, i.e., 30Gy/10# for the intracranial lesion. After completion of whole brain radiation therapy, patient was started on chemotherapy consisting of BCD, i.e., injection of bortezomib (1.3 mg/m2, day 0, 7, 14, 28) + injection of cyclophosphamide (300 mg/m2/week) + tab. of dexamethasone 20 mg/week. Post three cycles of chemotherapy, she was admitted to the emergency department with bilateral consolidation. X-ray done was suggestive of bilateral consolidation. Blood investigation showed a nonneutropenic picture; however, the biochemical investigation pointed toward acute kidney injury-like features with electrolyte imbalances. Further, patient was given ventilatory support in view of falling saturation with injectable vancomycin 15 mg/kg twice a day and injectable meropenem 1 g thrice a day. Later on third day, injection of liposomal amphotericin B 3 mg/kg/day was added; however, on day 7 of the admission, patient continuously deteriorated with deranged serum creatinine of 7 mg/dl and succumbed on the day 8 of the ICU admission. MM is a hematological malignancy characterized by a monoclonal proliferation of plasma cells usually presenting with hypercalcemia, osteolytic bone lesions, anemia, renal insufficiency, and frequent infections. Ocular findings in MM may arise from systemic effects of the disease (increased blood viscosity) or infiltration of plasma cells into ocular tissues. These ocular findings may include crystalline corneal deposits, exudative macular detachment, ciliary body cysts, and retinal hemorrhage. Orbital involvement is a rare presentation of the disease.,, Orbital myeloma most commonly presents as a unilateral solitary soft tissue intraorbital tumor, which is an extension of bony deposit and is associated with bone destruction. The most common clinical sign of orbital involvement in MM is unilateral proptosis, while hyperemia, pain, diplopia, and low vision occur less often. CNS involvement due to MM can be in the form of central as well as peripheral nervous system involvement. CNS includes either involvement of brain and the meningeal structures or the spinal cord. The various manifestations include either lethargy, nausea, vomiting, headaches, confusion, paresthesia, or seizures, visual, gait, and speech disturbances in case of involvement of brain parenchyma. Those with vertebral collapse or extradural lesions present with spinal cord or root compression. Peripheral nervous system involvement can be an isolated mononeuropathy or polyneuropathy secondary to amyloidosis or as a part of the polyneuropathy, organomegaly, endocrinopathy, monoclonal gammopathy, and skin changes (POEMS) syndrome. Meningeal involvement by a myeloma is an uncommon event, occurring in approximately 1% of cases of MM. Chemotherapy and intrathecal therapy have been reported as treatments with or without radiotherapy with survivals ranging between 2 and 6 months for CNS-MM. The treatment is based on similar lines as the treatment for leukemias and aggressive lymphomas invading the CNS, and includes intrathecal chemotherapy or combination systemic chemotherapies that cross the blood–brain barrier, with or without cranial irradiation. Systemic chemotherapy agents used with mostly transient responses include a combination of doxorubicin, cyclophosphamide, melphalan, bortezomib, and the immunomodulators thalidomide and lenalidomide. Although most of the chemotherapeutic regimens used to treat CNS myelomatosis, including bortezomib and the immunomodulators thalidomide and lenalidomide, are not known to cross the blood–brain barrier, they have been described to have activity against CNS-MM, which probably could be due to the disruption of the BBB and increased vascular permeability within the tumor. Novel agents such as pomalidomide and marizomib seem to show some promising effects., Of all the treatment modalities, cranial irradiation has been described as best therapy for this peculiar location of MM since the past. However, with the advent of the immunomodulators, they have been shown to be effective in the treatment of CNS myelomatosis. MM though usually present as CRAB (alteration in calcium, anemia, renal failure, bone lesions) features, however, proptosis or the brain parenchymal involvement is rare and is being rarely reported. However, in our case, proptosis as well as the parenchymal involvement at presentation was unique feature and to the best of our knowledge this is the first case report of such sort. Proptosis and CNS manifestation such as hemiplegia or cranial nerve involvement can be the initial manifestation of MM and should be considered as the one of the diagnosis especially in patients with appropriate age and other manifestation. CNS presentation or proptosis is a rare presentation of MM. It should be considered where circumstances appropriate for the age and symptomatology exists. No formal guidelines exist for its management and whatever reports available are just available as documented cases. Fassas AB, Muwalla F, Berryman T, Benramdane R, Joseph L, Anaissie E, et al. Myeloma of the central nervous system: Association with high-risk chromosomal abnormalities, plasmablastic morphology and extramedullary manifestations. Br J Haematol 2002;117:103-8. Knapp AJ, Gartner S, Henkind P. Multiple myeloma and its ocular manifestations. Surv Ophthalmol 1987;5:343-51. Rodman HI, Font RL. Orbital involvement in multiple myeloma. Review of the literature and report of three cases. Arch Ophthalmol 1972;87:30-5. 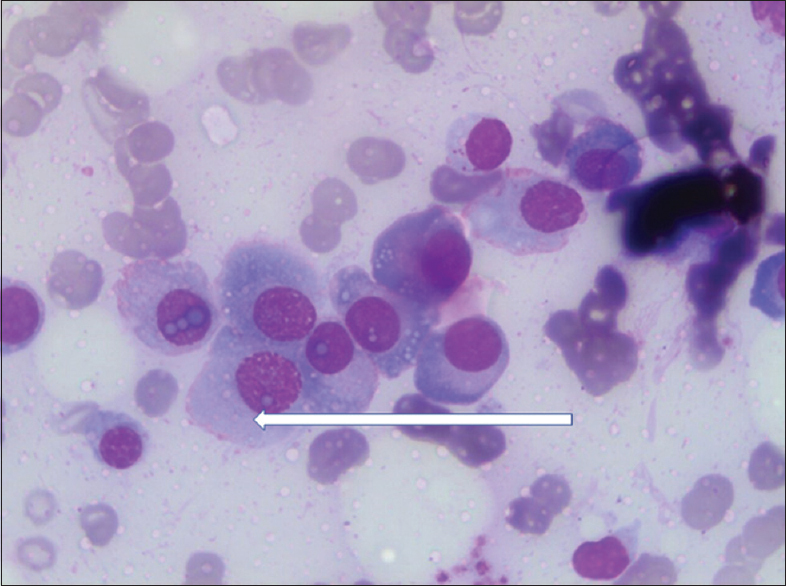 Sharma S, Kaushal M, Chaturvedi NK, Yadav R. Cytodiagnosis of multiple myeloma presenting as orbital involvement: A case report. Cytojournal 2006;3:19. Ajithkumar TV, Sivasankar C, Ramachandran K. Orbital multiple myeloma: Case report and review of computed tomography features. Austr Radiol 2002;46:119-20. 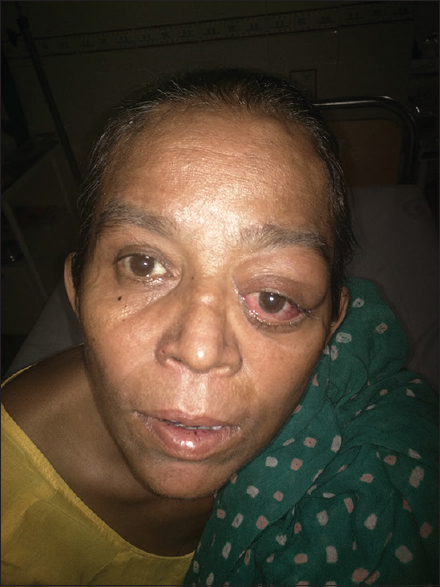 Malik A, Narang S, Handa U, Sood S. Multiple myeloma presenting as bilateral orbital proptosis. Indian J Ophthalmol 2009;57:3935. Mendez CE, Hwang BJ, Destian S, Mazumder A, Jagannath S, Vesole DH. Intracranial multifocal dural involvement in multiple myeloma: Case report and review of the literature. Clin Lymphoma Myeloma Leuk 2010;10:220-3. Somers LJ, Shaw B, Lyn BE, McMillan AM, Mahendra P. Meningeal myeloma in the absence of systemic disease, and as the initial feature of disease progression. Clin Lab Haematol 1998;20:189-90. Peest D. Multiple myeloma. Ther Umsch 1996;53:147-51. Wavre A, Baur AS, Betz M, Mühlematter D, Jotterand M, Zaman K, et al. 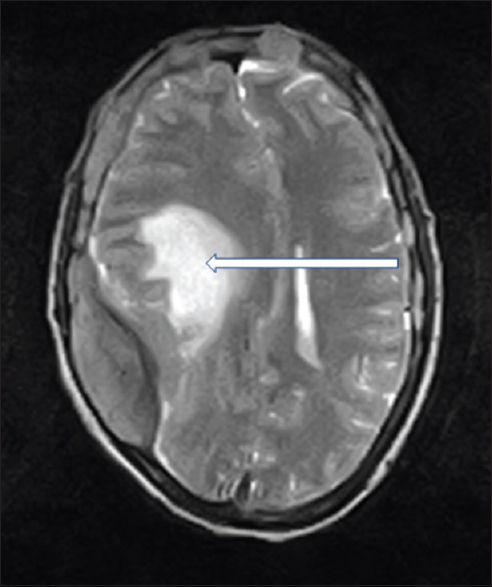 Case study of intracerebral plasmacytoma as an initial presentation of multiple myeloma. Neurooncol 2007;9:370-2. Vatansever M, Bozkurt FM, Dinç E, Yılmaz EB, Nayir E, Sarı AA, et al. Orbital metastasis of multiple myeloma: Case report. Turk J Ophthalmol 2016;46:148-50. Gozzetti A, Cerase A, Lotti F, Rossi D, Palumbo A, Petrucci MT, et al. GIMEMA (Gruppo Italiano Malattie Ematologiche dell'Adulto) Myeloma Working Party Extramedullary intracranial localizations of multiple myeloma and treatment with novel agents: A retrospective survey of 50 patients. Cancer 2012;118:1574-84. Mussetti A, Dalto S, Montefusco V. Effective treatment of pomalidomide in central nervous system myelomatosis. Leuk Lymphoma 2013;54:864-6. Lawasut P, Chauhan D, Laubach J, Hayes C, Fabre C, Maglio M, et al. New proteasome inhibitors in myeloma. Curr Hematol Malig Rep 2012;7:258-66.